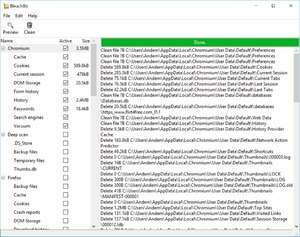 BleachBit is an extremely useful and versatile freeware portable system cleaning application which removes junk from your PC extremely effectively and quickly. It helps to maintain your privacy by clearing out cache, cookies, history, logs and temporary files. Another great feature of BleachBit and probably where it gets its name from, is the great feature to completely delete deleted data. If you weren't already aware, once data is sent to the recycling bin and then emptied from there, the data you supposedly deleted still lingers on your hard drive until that exact sector is overwritten. For security reasons, you should also check out the BleachBit download at LO4D.com which includes virus and malware tests. Additional screenshots of this application download may be available, too. BleachBit download been highly rated by our users.